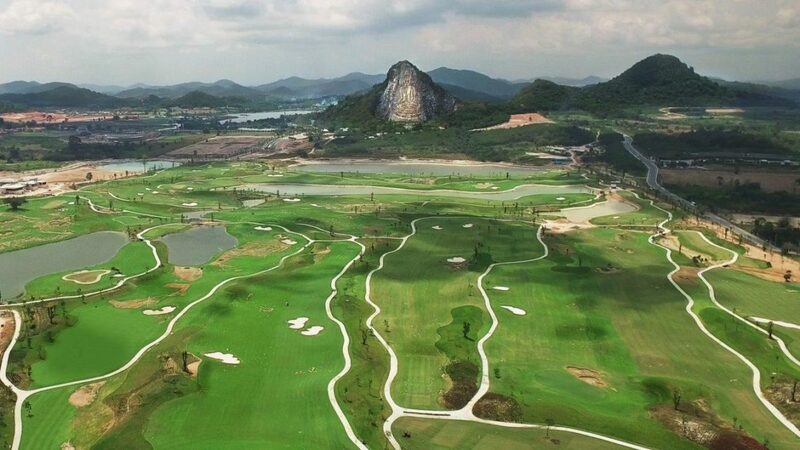 PATTAYA, Thailand (Feb. 4, 2019) – With a December christening here at Chee Chan Golf Resort, the course architects at Golfplan have again showcased their skill at integrating world-class golf holes with signature elements in the local landscape and culture. Hard by the Gulf of Siam, the dominant element is the Chee Chan Buddha, whose serene likeness has been carved into a limestone escarpment some 110 meters high. “Buddha Mountain” is one of the region’s best-known tourist and devotional attractions. Today, his gilt-edged visage is visible from nearly every spot on the 220-acre property, including the entire opening hole. “We couldn’t afford to miss that opportunity – to start golfers on their spiritual journey under the watchful eye of Siddhartha Gautama,” said Golfplan Partner David Dale. “The Buddha invites a decision on the very first tee: play conservative to the right/lower landing area and approach the green uphill, over deep bunkers — or drive more aggressively (left of the center bunker) to create a downhill approach to unguarded putting surface. • In October, the firm opened the full 18 at Lake Victoria Serena Golf Resort & Spa in Uganda, where Ramsey designed an enormous man-made lagoon that divides holes 1 and 9 from 17 and 18, accommodates the property’s sparkling new marina, and integrates the entire property directly with its primary attraction, mighty Lake Victoria itself. • Ramsey also applied the finishing touches this fall to Tabori Hills, a resort track to open next year in the former Soviet Republic of Georgia. Thanks to Ramsey’s routing, this cliff-top design will afford golfers stunning, long views of the Georgian capital, Tbilisi (where downtown patrons can access the resort by gondola). 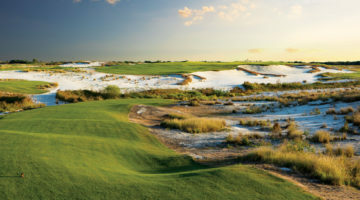 • Dale couldn’t make Chee Chan’s grand opening; he was in Korea, debriefing with PGA Tour officials following The CJ Cup, which is contested over his feted design at The Club at Nine Bridges (No. 41 on Golf Magazine’s world top 100). Dale watched most of October CJ Cup from the sleek, modernist teahouse behind the 14th green. “South Korean designs must, according to local custom, feature teahouses in the middle of each 9,” Dale explained. “We spent months routing and rerouting that stretch of the back nine at Nine Bridges — to create the perfect perch for that teahouse. We did the same on the homeward stretch to create dramatic views of Mt. Halla, which is sacred to the Korean people. Buddha Mountain was created on the northern face of Khao Chee Chan in 1996, to commemorate His Majesty the King of Thailand’s golden jubilee. It’s been a major domestic tourist draw ever since — enough to invite subsequent development of a water park, winery and shopping district. With new accommodations and world-class resort golf added to the mix, this corner of Pattaya (just 90 minutes from Suvarnabhumi International Airport) is a fully fledged destination unto itself.